I thought the idea of a free beer vending machine was a great idea, but I'm liking this machine's offerings even better. It's at a range in Beaver Falls, PA. But of guns or ammo are involved, you can be sure someone objects. Amazingly, it's some members of the club who have their knickers in a twist over this innovation. A vending machine operated by a candidate for Beaver County Sheriff that distributes firearms ammunition is raising some eyebrows. 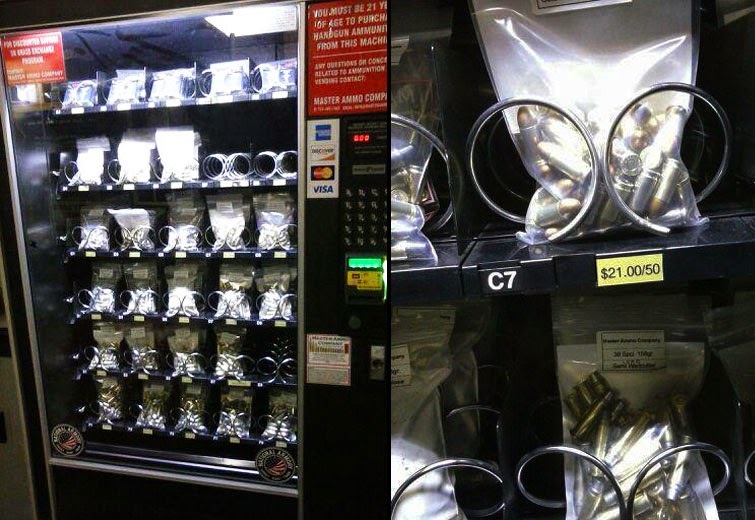 The machine is installed inside of the Beaver Valley Rifle & Pistol Club, offering both rifle and handgun ammunition and operating in the same fashion as vending machines commonly used to sell snack foods. The Beaver Countian received several tips from members of the Beaver Valley Rifle & Pistol Club (BVRPC), located next to Brady’s Run Park in Brighton Township, who said they have concerns about the appropriateness of using a vending machine to sell firearms ammunition. This publication was provided with several photos taken of the machine by the members. The club’s vending machine is operated by Master Ammo Company, a small ammunition manufacturing business owned by Sam Piccinini, a Rochester Township patrolman and Republican candidate for Beaver County Sheriff. Members of the club who are under 21 must be accompanied by an adult when they are at the club, so there doesn't appear to be an issue with those under 21 getting unsupervised access to dangerous pistol ammo. When I first heard about this, I thought the objections were coming from the hoplophobes in the public. Sounds like another case of the "I'm a gun owner, but..." rhetoric we hear so much from the anti-2nd amendment politicians. I don't understand how the objecting members can rationalize allowing young adults in the club, but at the same time objecting to their access to ammunition. Saw that. It would be handy as all get out if the stuff was reasonably priced. Agreed. My ammo seems to run out quicker at indoor ranges too.